1. The target audience for the film? Older generations? Grandparents? In terms of characters, relationships, children, grandchildren, issues? 2. The start of the film, comfortable, homes, Little Shangri- La, the cemetery, the Real Estate office, the lounge and bistros? The contrast with the poor areas of the town, drug areas? The fair and the entertainment? 3. The range of songs, Joni Mitchell, Both Sides Now, Clouds, Blue Moon, The Shadow of your Smile…? 4. The title, ordinary, the easy pace? 5. The credibility the characters, ordinary and complicated? 6. 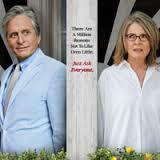 The character of Oren, Michael Douglas and his screen presence? The initial driving, going to the cemetery, Sarah Death and his life with her, talking to her at the grave? Seeing the dog and firing the paintball? His son, his life drugs, misbehaviour at his mother’s funeral, into signing him? 10 years passing? His wanting to sell the house, his pitch to the Vietnamese, thinking they were Chinese, to the black couple, not realising the wealth of the sporting couple? His relationship with Claire, her grandson, working in the company? The estimated sale for the house? Office life over the years? His crotchety personality, the aftermath of his wife’s death? Lear and her living next door? Going to the bistro, listening to her songs, her crying, his explaining how she should seem, not cry? Offering to be her agent? His son, coming to the house, bringing the granddaughter, six months in prison, his wanting his father to care for her, his refusal? Lear, taking the little girl, nice, ice cream, talking, drawing, the caterpillars? Oren and his blood talk? The range of neighbours, the parents and their cheeky kids, their noise, the boy and his change and orange remarks? Wanting to find out about Sarah’s mother, the detective next door, employing him, getting the address? The detective leaving it on the desk? His wife, her pregnancy, the birth sequence, Oren having to help, Leah’s arrival? The visit to the mother, her collapsing after seeing her daughter? Going to the fair, the rides, the happy birthday? Lear and the talks with Oren, the drink, the night together, his immediate going, clay and her diagnosis? Hearing the truth about his son, employing the lawyer, little again to the present, the sun getting out? In picking him up, acknowledging him as his son? Lear, the audition, his making the contract with his friend? Her practising, are going to the gig, the performance, telling her story, singing The Shadow of your Smile? Oren driving her home, the proposal, the thinking through things? The plausibility of the marriage because the audience saw them in so much detail and interaction as they live next door? The finale, the family group, Sarah and her film about the caterpillars? 7. Leah, her age, her marriage to Eugene, the jobs, his death and the effect, a love, the story, losing the baby? Singing, crying? Calling herself grandma, her looking after Sarah, nice? On and off with Oren, the clashes? The pianist, playing, and reacting to him? The final performance after the audition? Her consent to Oren? 8. Claire, tough, the cigarettes, 44 years, her grandson? Her advice? 9. The clients coming to the house, the spiel, their reactions, especially to the photos? 10. The sketch of the neighbours, the interactions in Little Shangri- La? 11. The nice side of life, grief and disappointment, love and hopes for the future?